quinoa squash (summer and winter varieties) beans such as pinto, lima, kidney, black, etc. These crops having all been commoditized, they are grown on a massive industrial scale, globally. Accomplishing this requires that something else be displaced, be it a more appropriate native crop, a forest, or a native people. In the case of the great American fresh tomato, it can even be a Florida swamp. Course 1, being a Double Tomato Tart, focuses on the tomato. The tomato’s wild origins are along the western coast of South America, although its domestication seemed to occur in what is now Mexico. It was taken to Europe as a curiosity, an exotic ornamental plant considered too dangerous to be eaten. It slowly found culinary acceptance in France, Italy, England, and other parts of Europe. In the last 200 years, the tomato has overcome virtually all resistance to its charms, to the extent that it has lost many of them—especially flavor and personality. It has been manipulated to be uniform in size and shape, to be free of blemishes, and to ripen in warehouses and on transport trucks rather than on its vine. It even holds the distinction of being the first commercially available genetically engineered food, with the introduction of the “Flavr Savr” tomato in 1994. But amidst such glamorous distinctions there are problems. Seventy percent of all fresh tomatoes sold in the US are grown in Florida, in soil that will of its own accord grow nothing. A highly lethal brew of soil nutrients, herbicides, fungicides, and insecticides is injected at intervals into the sandy fields around Immokalee. Most of these agrochemicals are prohibited for use on other crops, but special sanction has been granted here. In similar fashion, basic labor laws are vigorously flouted, giving rise to immigrant worker conditions which Chief Assistant US Attorney Douglas Molloy considers “ground zero for modern slavery.”[iii] He should know—at any given time he is working on 6 to 12 slavery cases. There is very bitter irony here: the descendants of those that domesticated the tomato are forced into the most unnatural fields in order to supply it to American consumers even out-of-season. Although I am directly referring to tomatoes grown in Floridian fields, similar practices occur in some form or other across the planet, touching upon every major agricultural commodity. Industrial agriculture, as a system, is broken into disparate and sometimes opposing components, any one of which should provoke passionate outcry from each one of us. Plants are separated from their native conditions, removed from all natural sustenance, fertilized with petroleum products, and tended by workers that are exempted from modern labor law. With its diminishing nutritional profile,[iv] the commercially-produced tomato is nothing more than an economic product, and all efforts will be focused on producing it more cheaply. The key ingredient in this process is fragmentation. Every component is disconnect from its native character and/or environment—the tomato, the worker, the nutrients, the ethics, and the consumer. No one has a permanent vested interest in how things are going. Everyone is dispossessed. But leaving out of my house just above Watkins Glen, I can hook around the south end of Lake Seneca and travel north along the eastern shore. Passing winery after winery, I come to a one-lane partially-paved road. That road leads to a small family farm, in operation for nearly two decades. 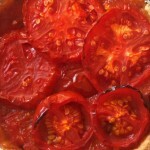 Their commitment to small-scale organic production provided the tomatoes that I roasted for this supper’s Double Tomato Tart. It is a testament to those doing it right in other pockets of the world. It projects hope for progress. Course 2, Truffled Gnocchi au Gratin, focuses on the potato. Unlike its cousin the tomato, the potato found almost immediate acceptance everywhere it was introduced. And everywhere it was introduced it led to an increase of population—some hold it responsible for 25% of the population growth in the Old World between 1700 and 1900. [v] It is an extremely nutritious food, and currently ranks as the world’s fourth most important crop. It is low in fats, high in carbohydrates, rich in Vitamin C and other micronutrients, full of minerals such as potassium, phosphorous, magnesium, and carries a good dose of antioxidants. It is cheap to produce and will grow under almost any conditions, making it a perfect source of sustenance for poor people everywhere. However, there is a significant complication: like the tomato, the potato we see today passed through a severe genetic bottleneck on its way to Europe. That is, only a few samples of the subspecies tuberosum were taken, and from them were produced several continents’ worth of potatoes. By contrast, in their native Andes, potato varieties number in the tens of thousands, and their massive gene pool bequeaths them a very robust resilience. The dominant global potato, however, with its compromised makeup, it is a sitting duck for blight, such as that which swept into Ireland in 1845. Irish dependency on the potato was a product of another feature of globalization: loss of food sovereignty. Though they had rich soil and produced an astonishing array of foods, they had no right to these foods. Marginalized by religious, political, and social maneuvers, they had become dispossessed tenants in their own land. So when the blight hit the potato crop, famine ensued. While thirty to fifty food-laden ships left their ports for Britain daily, over 1.5 million of the Irish died between 1845 and 1852. 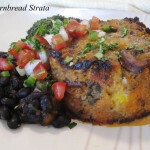 Course 3—Sofrito Cornbread Strata–is offered as a counter-illustration to the portraits of the tomato and potato. In this picture there are fewer genetic bottlenecks, even fewer governmental intrusions, and still fewer corporate logos. It’s an ancient practice wherein communities are self-reliant and food sovereignty is the norm. Within the milpa’s bounty lie nutritionally complementary foods, with a full span of amino acids, vitamins, fats, and other nutrients. It is a complete system that is not only supportive to our physical bodies, but also to the land upon which it grows. H. Garrison Wilkes, a maize researcher at the University of Massachusetts in Boston, has called the milpa “one of the most successful human inventions ever created.”[xi] Wilkes’ research led him to fields which have been in production for 4000 years, in sharp contrast to European American practices which led to soil depletion as early as 1820. In his book Larding the Lean Earth, Steven Stoll explores the turmoil of 19th century American farmers as they witnessed the exhaustion of their lands. Many stood for improvement through natural amendments to the soil. Many more chose movement—going westward into newer fields, which they in turn depleted. This low degree of stewardship over the land is the bedrock of our modern industrial system. Wilkes and other researchers acknowledge that the milpa is not a complete answer to our current dilemma; it simply cannot produce at an industrial rate. Yet the milpa is larger than its technical components: it is a model for sustainability; it is integrated, not fragmented; it promotes stewardship, not abandonment; it encourages community care rather than industrial abuse. Its diversity promotes robust resilience, insulating the community that tends to it. It is the epitome of food sovereignty. The final course, Peanut Butter Torte with Chocolate Ganache and Malted Vanilla Cream, is a treat fit for Moctezuma—and he could have enjoyed it thanks to his vast pre-Columbian trade network. While he could send for peanuts from present-day Bolivia, cacao from the deep tropics of Mesoamerica, and vanilla from the Caribbean coast of Mexico, we might have to import from India, the Ivory Coast, and Indonesia. The prima donna among this troupe is, of course, chocolate. Though its consumption was greatly restricted during its pre-Columbian days—due to the laborious processes and therefore expense of production—it has passed into almost daily consumption in North America and Europe, among people of all classes. As a commodity, chocolate, for the most part, is controlled by only a few corporations. As the Organic Consumers Association puts it, “The business end of chocolate is still the realm of the super elite with over 80% of the world chocolate market controlled by a handful of corporations. The European cocoa trade lineage has stayed virtually unsevered as corporations in the United Kingdom, Holland and Switzerland continue to be the major players.”[xii] They therefore control not only the market, but the entire supply chain. An integral part of that chain, naturally, is labor. One would expect a tangle of bureaucracy and obfuscation, certainly. But unexpected by many of us, perhaps, is that the protocol addresses only two countries– Côte d’Ivoire and Ghana—while the specific labor abuses exist worldwide. By focusing on only two countries, it allows the problem to flourish even more in other countries. The torte in the final course of this supper comes in the form of a pie slice. From the perspective of an aggressively competitive corporation, there are a limited number of slices in the pie. But from the ground level, where diversity, sustenance, and fairness govern, the pie is infinite. Toxicity by nature instills limitations. Life, however, when allowed to flourish, knows no limits. American Harvest—the theme for this edition of the Peace Meal Supper Club–holds a double-meaning for me. We have a wondrous bounty upon our tables, a harvest of so many life-giving foods that originated here in these two continents. But today these foods are accompanied by a harvest of oppression. While both harvests are our history, only one should become our legacy. [i] The term Columbian Exchange was coined by Professor Alfred Crosby in his book of the same name, published in 1972. In this landmark book, the first to break ground in the field of environmental history, he explored the biological and cultural consequences of Columbus’ landfall in 1492. [iv] Tomatoland, p. x; Estabrook derives his figures from USDA data from Agricultural Research Service reports, 1964, and the 2010 USDA Nutrient Database for Standard Reference, available online at www.ars.usda.gov. Food sovereignty is the right of peoples to healthy and culturally appropriate food produced through sustainable methods and their right to define their own food and agriculture systems. It develops a model of small scale sustainable production benefiting communities and their environment. It puts the aspirations, needs and livelihoods of those who produce, distribute, and consume food at the heart of food systems and policies rather than the demands of markets and corporations. Food sovereignty prioritizes local food production and consumption. It gives a country the right to protect its local producers from cheap imports and to control production.It ensures that the rights to use and manage lands, territories, water, seeds, livestock and biodiversity are in the hands of those who produce food and not of the corporate sector. Therefore the implementation of genuine agrarian reform is one of the top priorities of the farmer’s movement. [ix] Briefly, teosinte is the wild cousin to our corn.